Tribute piece to undoubtedly one of the greatest manga series ever. I used black Faber-Castell pens and a Prismacolor pen for the red. My favorite designs have to be Void, Ubik, and the Berserker Armor when influenced by Guts's Beast of Darkness. With those eyes sewn shut, exposed brain, and peeled back mouth, Void looks absolutely terrifying. The wolf is my favorite animal, so I instantly fell in love with the way the Beast of Darkness looks like the love child of Venom and a church grim. Ubik's my favorite God Hand member/(God Finger?). I find that evil squid blob creepy yet weirdly adorable. I plan to do a monochromatic blue drawing of just him and put that up here sometime. Nice work! 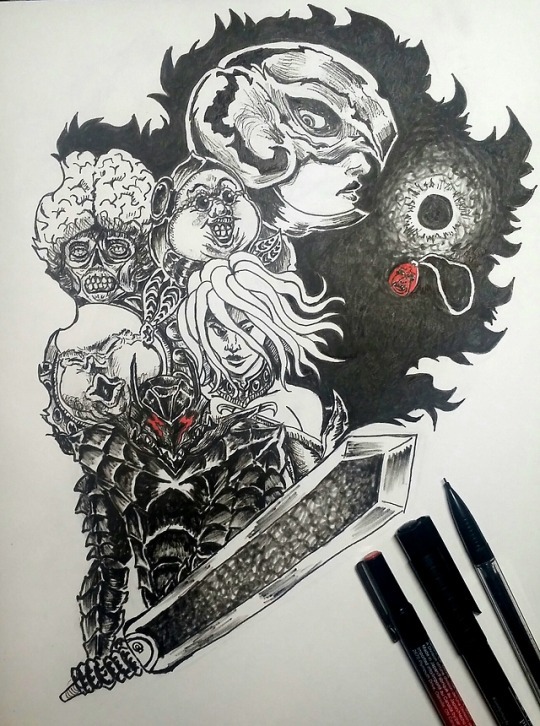 That's a cool, unique depiction of femto's "helmet." Is he falling apart? Or is the texture of Guts' cloak sort of being superimposed on him? Something else? Sibir, this is a great illustration, thanks for sharing with us! I liked how you varied the linework, and the way you handled the flat side of the DS turned out pretty neat! I might be wrong, but I think sibir is just showing the shine of his helmet, so maybe closer to your second guess? That's a cool, unique depiction of femto's "helmet." Is he falling apart? Or is the texture of Guts' cloak sort of being superimposed on him? Something else? Thanks so much for liking the art! I really enjoyed drawing it. I admit that I struggled somewhat with how to depict Femto's helmet. I was indeed going for the sharp shading in that screenshot and panel Bleac put up, though I probably made it look more fragmented than it really is, which is why SleepersWake may have made that comment about it breaking apart. The line patterns for Dragonslayer are the same for the eclipse. Honestly that could only work with a dying Faber-castell brush pen. (I need a new one so I can draw Zodd, who's very dark!) I really like how the fading whorls turned out.